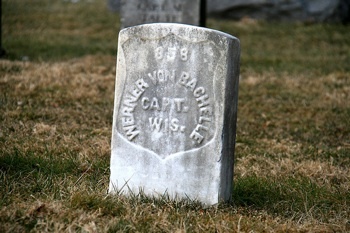 This is the stone at Antietam National Cemetery for Captain Werner von Bachelle, killed in action on 17 September 1862 at Antietam. He’s something of a celebrity today. School kids hear of him in their packets at the cemetery and battlefield. Though he died a brave soldier, like so many others that day, that’s not why he’s so well known. He owes his celebrity to his dog. The Regiment was part of the famous “Black Hat” Brigade (with the 2nd & 7th Wisconsin, 19th Indiana Infantry Regiments), and after a year of garrison duty around Washington DC, they first saw action at Second Bull Run (Manassas) in August 1862. Werner was promoted to 1st Lieutenant in December (Schumacher to Captain vice Lindwurm, discharged 12/11/61), and to Captain and command of his company when Captain Schumacher departed to be Major of the 21st Wisconsin (KIA Chaplin Hills, KY 10/8/62) in May 1862. 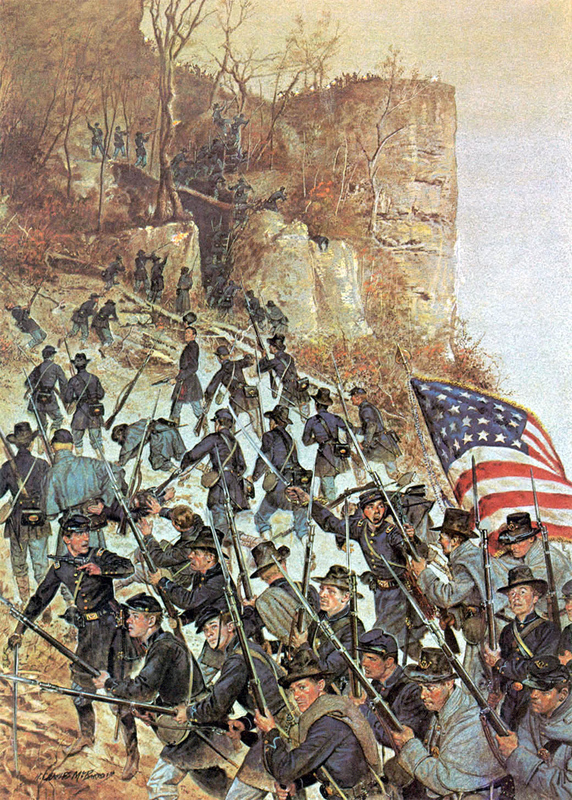 They were in combat next at Turner’s Gap on South Mountain on 14 September on the way to Antietam. You’ll notice some of those characteristic black hats in the painting. It was after action here that they began also to wear the the appellation Iron Brigade. Captain Bachelle was an ex-officer of the French army. Brought up as a soldier in the Napoleonic school, he was imbued with the doctrine of fatalism. His soldierly qualities commanded the respect of all, and his loss was deeply felt in the regiment. Bachelle had a fine Newfoundland dog, which had been trained to perform military salutes and many other remarkable things. In camp, on the march, and in the line of battle, this dog was his constant companion. The dog was by his side when he fell. Our line of men left the body when they retreated, but the dog stayed with his dead master, and was found on the morning of the 19th of September lying dead upon his body. We buried him with his master. So far as we knew, no family or friends mourned for poor Bachelle, and it is probable that he was joined in death by his most devoted friend on earth. There is a chance that dog is under that stone in the Antietam National Cemetery, too. Thanks to Janet Richardson for the OK to use her masterful gravestone photo here. Bachelle’s service dates are from the Roster of Wisconsin Volunteers, War of the Rebellion, 1861-1865, published by the State Adjutant General in 1886 – Vol. 1, pg. 516. There’s a beautiful and easily navigated electronic edition of the Roster online from the Wisconsin Historical Society. I failed to find him or his family name in either the 1850 or 1860 Federal Census for Milwaukee or surrounding counties, so I don’t know his place of birth or when he arrived in this country. In my search, though, I found an apparent majority of German families there in those years. Men and women born in the many principalities that later became the country of Germany, with many children born in Wisconsin. The painting illustrating the 6th Wisconsin on South Mountain is from a series at the Center for Military History (CMH), US Army, called The American Soldier (Set 5). The quote above is from Rufus R. Dawes’ Service with the Sixth Wisconsin Volunteers, Marietta (OH): ER Alderman and Sons, 1890, pp. 92-93. It’s online in full at the Internet Archive. First time I have ever seen this painting! Always interesting to see the artist’s interpretation of reality…. way too light out in the picture (sun from the west blocked by the South Mountains)….and I don’t recall seeing that steep a gradient nor the clifflike bluffs the several times I’ve been to the battlesites\Hwy 40\the National Road. I FOUND THE INFORMATION INTERESTING. I WAS SEARCHING THE NET FOR INFORMATION ON CAPT. VON BACHELLE AS I JUST AQUIRED HIS TEMPORARY WOODEN HEADBOARD AND THE SIDE OF HIS COFFIN FOR TRANSFER TO THE NATIONAL CEMETARY. THE COFFIN SIDE LISTED THE CAPT AND THE DATE OF REBURIAL AS 1868. THERE WAS AN OLD MUSEUM TAG ATTACHED WHICH CONFIRMS MUCH OF THE POSTED INFORMATION INCLUDING THE DOG STORY. ALSO, REGARDING THE PICTURE OF THE SOUTH MOUNTAINS, THEY’VE BEEN GREATLY “ENHANCED”.